If this adage is true, the Seychellois folks must be one of the “spiciest” on earth as kreol (or creole) cuisine is a spicy blend of the best from the continents of origin of the early inhabitants: Africa, Europe, and Asia. PART ONE. FROM THE TRADITIONAL KREOL KITCHEN TO THE MODERN! In the not so remote past when wood and charcoal were used as fuel and the cooking pot (“marmit”) was made out of “cast iron” (! ), the kitchen was detached from the main dwelling. These were the days when refrigeration was inexistent but the elders had so many methods to preserve their food. They could hang their victuals, their sausages or even salted fish high up above the fireplace safe from any four legged intruders. They did not need to buy smoked fish or smoked meat then! The large jars(“potis”)could also hold their salted meat for ‘letan dir”(the hard times) particularly during the south east monsoons( “vann swet”).This could be kept in their “bife”(cupboards) with other well prized food items such as “graton”(cracklings), lentils….and the many spices(pepper, onions ,garlic, ginger….). 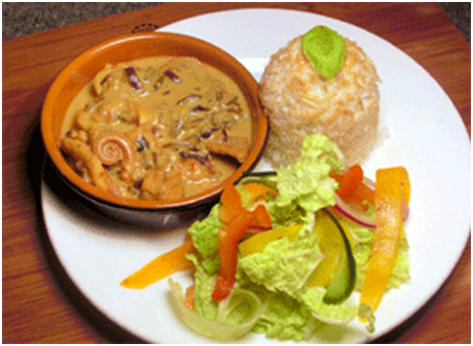 Seychelles octopus drizzled with a sauce of crushed chillies. “Gro manze” (root crops) such as cassava (“mayok”), sweet potatoes (“patat”), plantains (like “bannann Sen Zak”, “bannann kare) breadfruit (“fiyapen”) were in the past the staple diet of the Seychellois. They were usually boiled to accompany the savoury dishes such as “satini pwason sale” (salted fish chutneys), “kari zourit” (octopus curry) or any “kari koko” (curry with coconut milk and “masala” added). The traditional kreol dessert had many ‘ladob’ prepared by cooking the “gro manze”(breadfruit,cassava,bananas) with coconut milk and sugar adding ,if one wishes, some vanilla, cinnamon, ‘miska’(nutmeg) or any other flavour. One of the most well-known traditional dishes for the less wealthy then, but today shared with our visitors, is the “katkat bannann” (cooked green bananas, usually plantains, mixed with coconut milk and fish preferably…a “latet karang”(carangue fishhead)! In traditional Seychelles- kreol cooking there is a variety of dishes for all the palates. 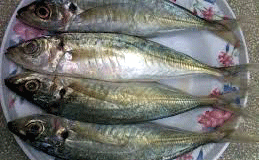 “Bouyon” may be the equivalent of “rougaille” in Réunion or “seraz” in the Chagos but in Seychelles it is also used for all sort of broths or soup with only fish such as “bouyon blan” or made with a variety of spinach(Chinese cabbage”bred sou-d- sin”, “bred lanma”, “bred marten”, the popular “bred mouroug”, “bred paryate”r…..). 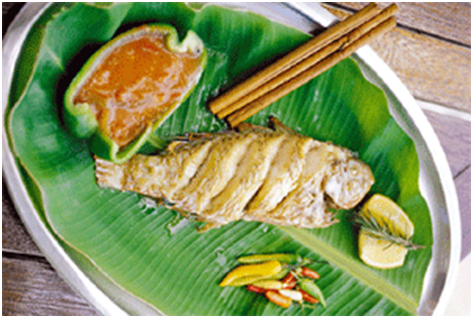 The fish head soup such as that of the “karang” or “bourgeois”( red snapper) is exquisite accompanied by a hot “satini”(chutney) made from one of the numerous tropical fruits such as the pawpaw(“papay”) or “frisiter”(golden apple), or even the eggplant(“brenzel”). 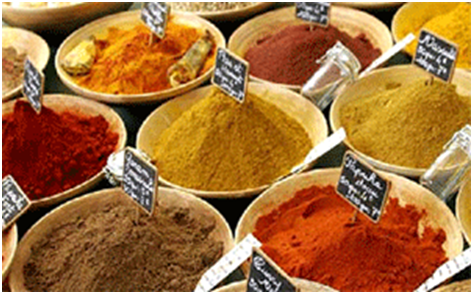 Curries prepared with hot masala, originally from Asia, now more and more locally made, is very popular in Seychellois kreol cuisine added to any kind of meat and fishes which can be chosen from the hundreds of species abounding in our ocean. More and more the Seychellolis add more variety to the local kreol cuisine depending on the availability of ingredients. 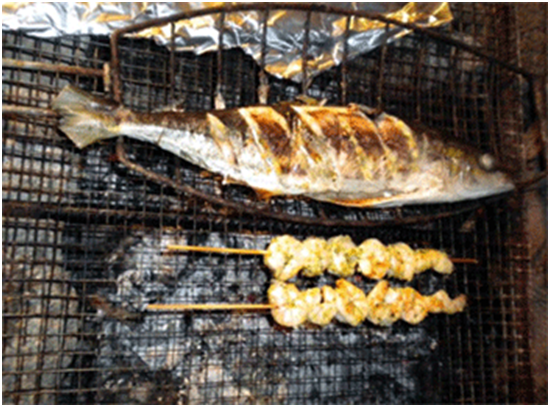 Barbecues is a substitute to the grilled fish of days gone by when the glowing charcoal in a “reso” was used to cook during the “mackerel season” the abundant fish wrapped in banana leaves and seasoned with chillies and “bigarad” . The “boukannen” too was popular though grilled “bourgeois” which is today available to all was then was only reserved for the wealthy!